We participate in various tournaments and aim at the technical improvement. Our company does a whole cycle of works related to fireworks !! starting from purchasing the materials, then designing fireworks, the actual making, planning a show, and launching fireworks. We keep Japanese traditional techniques that are famous all over the world and work hard to produce fireworks that would have acute sensitivity. To improve our technology even more we participate in national fireworks competitions trying to grade up our high-quality creativity. 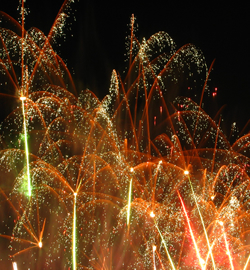 We never stop challenging for even more beautiful and outstandingly creative fireworks. 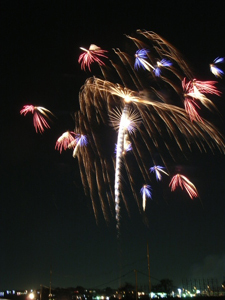 The fireworks creations made up with the world's best Japanese firework technology have a value that cannot be measured in money. 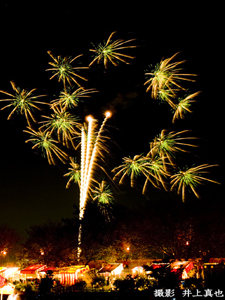 Participating in the contests we do not only show new shapes of fireworks, but it is a good chance to exchange information with other fireworks professionals and to estimate the improvement of skills of fireworks artists from all over the country. 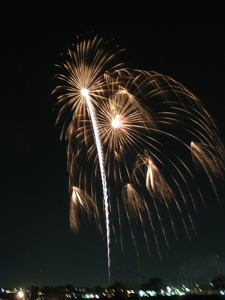 A Tsuchiura All Japan Firework Competition held each year in autumn is one of the main fireworks festivals in the country. The chosen prominent fireworks professions from all over the country put their whole spirits into every single shot. 1951 was the first time when a prize from Trade and Industry Minister and another prize from Middle and Small Business Chief Officer was introduced. 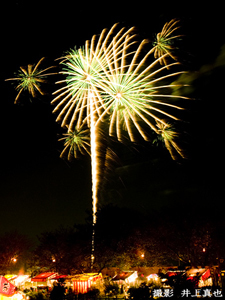 In 2000 the Prime Minister’s prize was added, and until now it is the most honored decoration for fireworks masters. 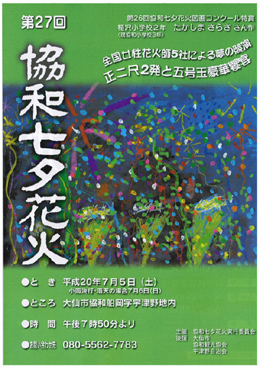 We take part in this competition as representatives of Ishikawa prefecture in a section of creative fireworks. 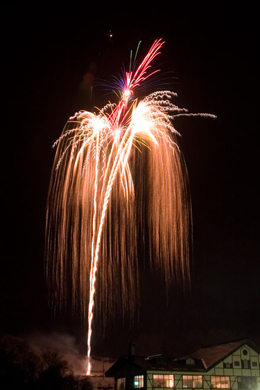 Creativity of fireworks is most important there, and originality and new technologies are valued. Let us introduce here some of our past creations shown at the competitions. We presented the following works and received merit awards for them. 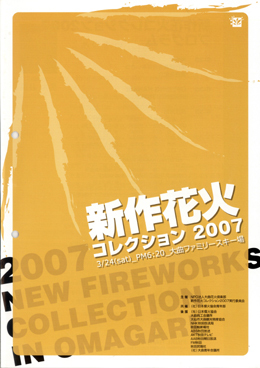 2008 "A lot of sunflowers",2007 "Shinning heart",2006 "The captive princess","Jack pot"
This is a competition where 28 chosen young leading fireworks professionals from all over Japan present their unique sense in newest works. The program is 10 launches of No. 4 fireballs and 5 launches of No. 5 fireballs. Each participant makes his own theme on these 15 launches. The judging is based on how much of the high-quality technology was used in this limited amount of shots and how high was the creativity and how was it expressed. The jury decides on 3 key points, the expression of the theme, the technology and the safety. The regular audience reaction is also important in evaluation. The profiles of the artists, the names of their fireballs and their theme names are presented in a contest brochure. This is a festival where an original sensitive world of each participant can be enjoyed. 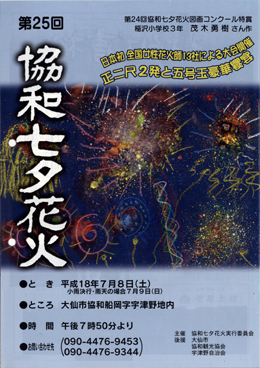 Kyowa Tanabata Fireworks are famous for its big scale because there are mainly 2 shaku fireballs launched. There is an All Japan Female Firework Masters Contest held within this even, and we participate in it from the very first time it was held. In 2006 on the 25th Festival there were female masters from 13 companies, and we presented 2 No.5 programmed launches with 3 No. 5 free launches, getting the Special Prize. From now on we will also aim on the top prizes building on the characteristic female creativity and making glamorous fireworks.